Often with unisex watches that are not physically large, one of the problems if showing a date window is they are so small and therefore difficult to read. Rolf Cremer Bogen Gent from Germany. Double Date clarity. I found this model Rolf Cremer Bogen Gent 492801 Quartz watch recently that solves the problem neatly with the addition of a proper Double Date window set in it’s plain color dial. Numerals and indices are omitted for clarity and the good contrasting red colored hour and minutes hands are complimented by the centre seconds hand with it’s black dot pointer. The double date aperture is @12 and is designed as the main feature of the watch. 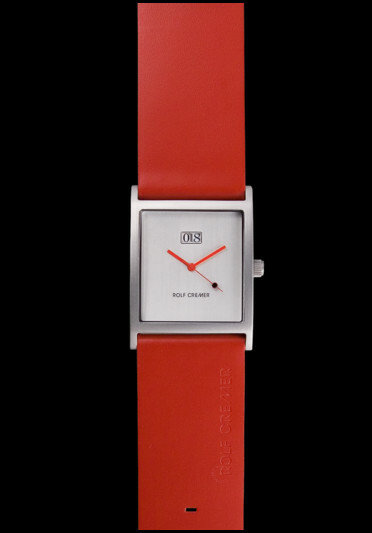 The crystal is mineral glass, the case in stainless steel and the wrist band is in complimentary red quality leather. Dimensions of the watch are neat at 34.3 mm wide, 9.5 mm depth and 45.5 mm lug to lug and overall the watch has a superb modern clean line look, perfect for day or dress wear. Another plus is the fact the watch is not expensive at around 139 Euros. In my opinion this is a great example of good design and function. Clear to read, elegant looks and deceptively simple in form, it’s one of those models that’s just perfect for those little occasions – not flash, not minimalistic silly – but rather elegant, modern and rather refined.